A cloudless blue sky looms over the tepid waters of the pool – a light breeze brushes the leaves, startling them into whispered conversation. The liquid glass surface shimmers beneath the sunlight, rippling gently against the pool’s edge. The days of summer stretch out ahead of me, sparkling like the ginger bubbles in a glass of champagne – when work is finished I trade my clothes for my bathing suit, and spend an hour gliding through the tranquil water, soothed by the haunted cry of the gulls calling out to their nests. Summer had been a long time coming this year, finally bursting out of the mists of a wet cold spring. In the last several months RA had moved into my feet, making them cry out in the night, waking me from restless sleep. 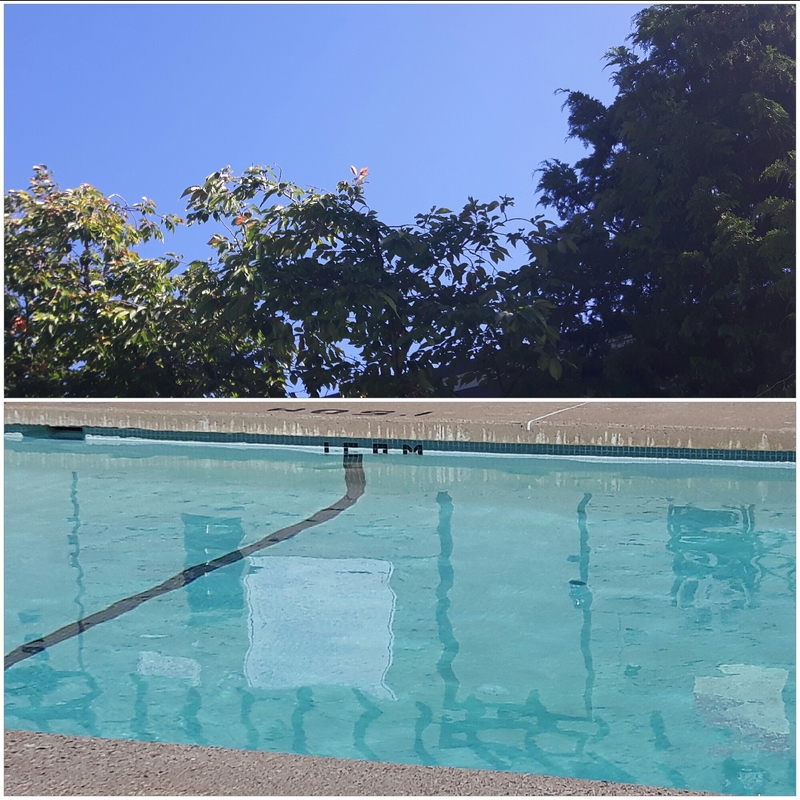 Like the stiffness that settles into my joints overnight, movement soothes their burning ache, and each morning arrives with another opportunity to shake it off, get up and move, take a walk, do some stretching, and go for a swim. There are moments and places when I feel free of RA. The first place is in the desert. My body absorbs the dry red heat, delivering its soothing warmth to every one of my joints, stripping away the dull aching pain that always thrives there. There among the cacti, I am swept back to a time before RA – no pain, no stiffness, no unpredictable flares – it’s as if the desert contains the power to tame old lady RA in me, and I always wish, in my brief visits each year, I could bottle up that elixir and take it home. The other place when I am free from RA is in the water. In the water, nothing hurts. I am fluid and graceful. In the water I can do anything. I can move the way I used to, before the cloying stiffness of RA arrived, turning my willowy cadence into a stiff and painful beat. The water restores me, returns to me to the lively days of my youth. It wasn’t always like this. There was a time in my early childhood when water scared me. I was reluctantly dragged off to swimming lessons, terrified of that tepid liquid closing over my head, like some monster released from my closet. It’s ironic how we can fear something that carried us for nine months in our mother’s womb. It has always been there. It’s a part of us, it’s what sustains us. I eventually got over that fear and became a true water baby. Water is liquid comfort to the person with RA – at least it has become that for me. Every year I wait for the turning of the season so I can return to the waters, and hold RA at bay for a few months. I appreciate its gentle massage over my skin, I revel in how easy it is to move in; I love how it supports me, taking all pressure off my joints, making me buoyant and carefree. There was time I danced on my toes on a vinyl dance floor in a studio of mirrors; now I dance with the ripples beneath a blue summer sky, twirling, floating, and weaving a new composition of life with RA. Reading this after spending a wonderful afternoon in my cousin’s Pool, moving freely and without pain. Wonderful. JG many years ago I took an arthritis foundation aqua class. I was one of two males and by far the youngest person by at least 20 years. I do not wear a ring because of my hand joints. This led the many ladies to believe I was single. I noticed that several of the ladies were overly concerned with my well-being. I missed two classes as the result of work obligations and I I started receiving calls. Oh rick this is ,, I am calling to check on you, or Rick this is ,, We missed you are water class. Rick, I hope that you are able to get back in the swim, if you’re not already doing so. When I used to teach “aquabics”, as it was called in my pool, the class was filled with women of all ages, sizes and abilities. Unfortunately, there was 1 man, who *ahem* disappeared under water when we were doing certain leg exercises. Suffice to say, he wasn’t there for the exercise. It was actually so darn funny. Not since ,, (well i was going to say HS but that is not true) so not since never have so many women been interested in me. 40 years of RA have been tempered by the joy I get whenever I jump into the pool, ocean, river or lake and start swimming.